Samantha began competing in cross-country running and track & field in Junior High School. 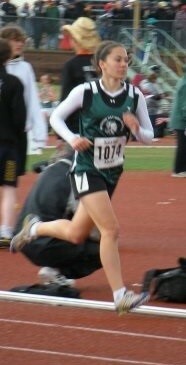 After winning her very first cross-country race in Grade 7, she continued to finish top 2 in Zones each year thereafter. When training with the MHHS track team she competed in the 1500m, 3000m, triple jump, and 4x400m relay at the Provincial level. Her best finishes were 4th and 5th in the 3000m and 1500m races, respectively. In addition to running, Samantha competed Provincially in ringette, soccer, and badminton. She not only achieved success with her teams, but also medalled as an individual in badminton – bronze in Intermediate Girls Tier II, then 4th in Senior Girls Tier I. Running gave Samantha the ability to excel in many sports, and was named MHHS Female Athlete of the year in Grades 11 and 12. Following high school, she continued with college soccer and ringette, and began competing in CrossFit competitions. Samantha holds a BSc degree, is a Certified CrossFit Level 1 Trainer, and a Certified Fitness Trainer. As a coach, she strives to strengthen the foundational properties of athletic movement which sport-specific skills can be built upon. Her goal is to increase fitness and reduce the risk of injury by applying cross-training strategies for athletes of all sports.